Here's a video compilation of the funny moments when Bb. Pilipinas host Toni Gonzaga injected during the pageant's Q&A portion humor that some said was fit for a comedy bar. This one's spliced and compiled by Facebook user Pau Jasper Sy, but all credits go to the rightful owner of the broadcast rights, ABS-CBN. Post by Pau Jasper Sy. Toni received mixed reviews on social media after she poked fun on the candidates as well as the judges during the prestigious pageant held Sunday, March 15, which she hosted with actor Xian Lim. Those on her side said the Kapamilya star is a "true entertainer" and had "great energy." Her punchlines, they said, were a "breath of fresh air" and her jokes made the supposedly elegant event "less formal" and "more fun." MTV VJ and radio DJ KC Montero said he loves Toni's hosting style, calling her "the most sarcastic host to ever hit the BB. Pilipinas stage." YouTube sensation Bekimon found her remarks funny, particularly at the time when she made fun of Binibining 28 Hannah Ruth Sison's earrings, saying it "has its own theme song" and singing "I’m gonna swing from the chandelier" as she held the contestant's jewelry. On the other hand, some people criticized Toni for turning the coronation night to a "comedy bar." One of them is Bb. Pilipinas-Universe 2000 Nina Ricci Alagao, who said the Pinoy Big Brother host should "leave that kind of hosting to PBB, not BBP." 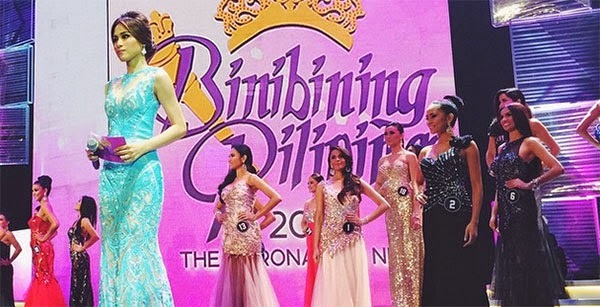 "The way she prodded some of the judges to proceed with the Q&A was as if she was at par with these well-respected people in terms of age and experience," the former beauty titlist posted on her Facebook timeline. "I hope she realized that the one person she ridiculed the most for the world to see was none other than herself, proving that even though she may have hosted many events and shows in the past, hosting a prestigious beauty pageant may not be for her." Alagao deleted her rant and apologized after she received flak from netizens who defended Toni. Cary Santiago, a local fashion designer, meanwhile said he find Toni's approach "inappropriate" and "rude to the candidates whose nerves are shot already." Thousands of comments are being posted on social networking sites as netizens continue to argue about Bb. Pilipinas host Toni Gonzaga's jokes.